i am confusion, 113 top speed? 5.3 0-60, WTF? good acceleration, top speed worse than many regualr cars. Eight minute lap with 113 mph top speed...great handling! 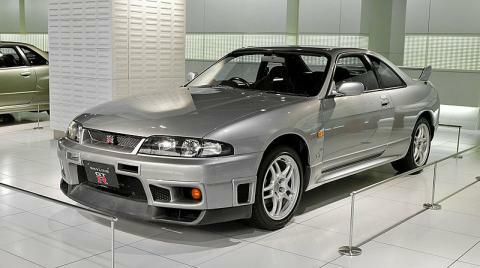 The 8:01 lap time in nordschleife belongs to the R33 V-spec not the standard R33. The full lap is watchable on Best Motoring R33 Special. It's clearly stated it's the V-spec at the end. Also, why is there no R33 V-spec page in fastest laps? There's only this made up V-spec II with wrong stats. 300 bhp car from the mid 90's that lapped ring in under 8 minutes (also being the first ever production car to do it) and you say terrible times? Terrible times for the 33, But then again it want the top of the line V-Spec, Still a great car even today, I even considered getting one before i got my 34, But the 34 is more my type, Plus it looks and drives way better, You can get 33s for a good price over here. Ode to a Skyline: We test Nissan's wildest carâ€[quote]the Skyline GT-R V-Specâ€[quote]on its home turf, and get wing clipped, too. 0 - 100miles for this flying turd is under 5s beat that corvette! If you want to buy real estate, you would have to get the home loans. Furthermore, my mother commonly utilizes a bank loan, which supposes to be the most fast. lol@ fanboys submitting random YOUTUBE videos as \"proof\"
As if you can verify the car (s) aren\'t modified. Change that 5.5 second 0-60mph please... wanna know why those times wrong? Those were American and British magazines which means those cars were ALL used and possibly could have lost horses; plus many of the smarter automotive journalists cite their driving is not the best (i.e. Jeremy Clarkson) and to use a racecar driver instead (Though this shouldn't be hard at all...). go to unique media, scroll to bottonm and read the magazine. Its from Unique Cars, a respected mag here in Australia. Gives weight...and 0-100km time. Please stop this stupid keyboard war and fix this. Well considering it did a 7:59 round the Ring for the 90's, thats not slow. and if 0-60mph is done in 5.0s, 0-100kmh (62mph) should be about 5.3s or so. but than again, i really couldnt care, and BR, dont you own a skline? u should know if you do, but again, couldnt care less bout this car, just stating a comment. Wads, with all due respect if you could go through these sites and links we have posted and please ammend. I'm sure the purpose of this site was not to create keyboard wars but to share knowledge and passion we have about cars. Georg, unless you get rid of the attitude, your arrogant posts are not required here..find some place else. Go check out your audi's. You dont belong here mate. I am no fan of japcrap but if its incorrect then its gotta be corrected. If the car is capable of 0-30mph in 1.9 seconds, your saying it takes half a second to do 2mph? Mate, you clearly have no logic. Nor do you understand physics, and pardon the pun but you are a really arrogant 'prick'. It might have been the slowest to the 0-100 km/h out of the the R32-34 GTR's but it was easily one of the best around a track. 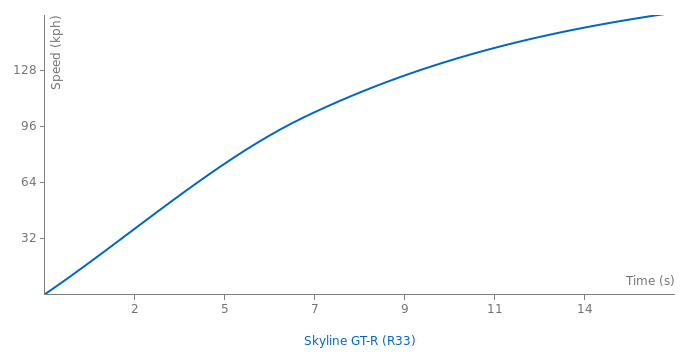 should I post the 5.4s Evo Magazine tested the Skyline R33 GT-R in a group compare between R32, R33 and R34 ..... and yes that was the R33 GT-R V-spec they tested with 5.4s 0-60mph...and it was by far the slowest of all GT-R´s nearly a full second slower 0-60 than the R34 GT-R V-spec..
come up with real test numbers by car magazines not with internet claims were everyone can claim everything... and don´t claim my freinds car can do this and that..no one cares..
no 0-100km/h time no adding to the data..btw... here we have already better time for 1/4mile and nearly the same time 0-100mph so the 0-100km/h time sounds correct.. and stays...the weight is a japanese best motoring claim from one of their videos not from the fantasy numbers of a fanboy side..